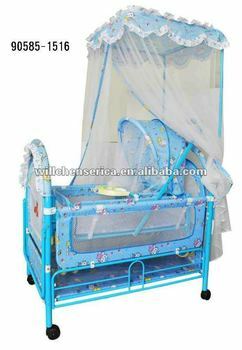 Metal Baby Bed w/high mosquito net,baby sleeping cardle, Wheels with Brakes. 2. With mosquito , mattress, sleeping cardle, wheels. 3. Steel frame cover by fabric. 4. Height of mattress can be adjusted in two position.